Recent feedback from manufacturers suggests an upturn in demand for certain types of industrial print kit, driven by the desire of both print service providers (PSPs) and sign-makers to expand their businesses and enter into new markets where they can win work. Here, FESPA.com speaks to some of the leading manufacturers in the industrial print market to find out more about some of the latest kit they have on offer, as well as the level and type of demand they are currently experiencing, in order to see where the key growth opportunities lie in industrial printing. One of the leading names not only in industrial print production but the printing industry as a whole is Canon. Mathew Faulkner, Applications Development Senior Manager, Graphics and Communications at Canon Europe, picks out a number of industrial trends that the company has noted in recent years. “Looking at the evolution of the industrial print market over the last decade, we have seen dramatic and sustained uptake of both flatbed and roll-to-roll production technologies,” Faulkner said. ‘This has been driven by sign-makers’ and graphics producers’ desire to diversify and take advantage of the capabilities of digital inkjet technology to print on a growing range of flexible and rigid substrates. There has also been a shift from analogue to digital printing, especially for products that were traditionally screen printed. “As print specifiers have increased their awareness of the advantages of digital production in terms of reducing print volumes and enabling on-demand delivery, greater design flexibility and customisation, demand for an increasingly diverse spectrum of speciality print applications has accelerated. At FESPA 2017, Canon launched the Océ Colorado 1640 roll-to-roll printer with Canon UVgel technology. Faulkner said that since this roll-out, interest in UVgel has been “extremely high”, with hundreds of printers now installed at sites around the world. Looking to build on this success at FESPA 2018 in May, Faulkner said Canon will once again be showing the Océ Colorado 1640, using the machine to produce a range of domestic and commercial décor applications, as well as self-adhesive labels. Furthering its industrial focus Canon will also demonstrate the Océ Arizona 6170 flatbed printer in a robotised workflow for maximum production efficiency across a range of application. “The demonstration will reflect a real customer implementation at Van Vliet Printing in The Netherlands, a forward-thinking Océ Arizona user who partnered with Canon and Rolan Robotics to achieve the highest level of automation in its flatbed printing operation,” Faulkner said. “At FESPA 2018, we will also be introducing our new elevated printing solution for the Arizona series, which enables customers to add textured effects to décor products, packaging prototypes and signage, maximising value and increasing their scope for competitive differentiation. Also active in this sector is Inca Digital, which, like Canon, will be in attendance at FESPA 2018 this year to showcase some of its latest industrial print solutions. John Mills, chief executive of Inca Digital, described the market as the “most exciting area of development in digital inkjet”. Mills added: “In almost every market sector, digital print can offer functionality and customisation options that are not economically viable with analogue printing. Many of the inkjet systems are now incorporating features that help to integrate into existing manufacturing processes. 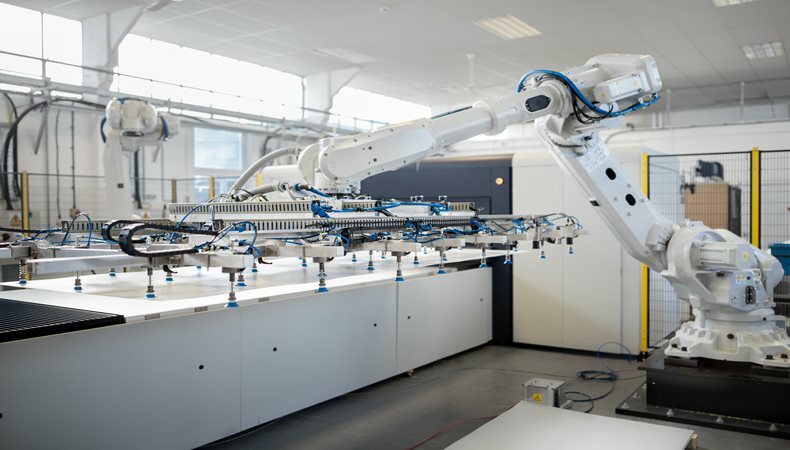 With this in mind, Mills picks out some of the products at Inca Digital that are proving popular at present: “On the automation side our dual robot system specifically lends itself very well to integrate into an existing production environment. This allows the customer to reduce the amount of manual labour to a minimum and focus on print quality and efficient management of the press. With our robot systems we achieve a high level of accuracy and repeatability, which supports industrial applications very well. Mills also take the opportunity to look ahead to FESPA 2018 in May, where Inca Digital is keen to speak with as many visitors as possible about their industrial print needs an explain where it can help. Inca Digital will present its entire range of products at FESPA 2018. On its stand, the firm will showcase the OnsetM and SpyderX platforms, as well as the Inca Connect workflow software suite designed to further drive productivity. Those in attendance will also be able to see the OnsetX3 with semi-automatic robot in the Digital Corrugated Experience area of the event. Elsewhere, INX supplies a range of products that, according to Stefano C, Marketing Manager EMEA, said are “making the difference in the market”. Rogora expanded: “First of all I would like to speak about our Plug&Play print bar by JetINX. This hardware could be configured with different printheads according the productivity and quality requirements, it’s scalable and it’s including all the necessary tools to be easily integrated. Rogora said it is critical for INX to keep up-to-date with developments in the market, so as it can respond to the changing demands of customers. With this in mind, he picks out a number of key focus points and trends that companies involved in industrial print should take notice of. Rogora said: “The industrial print market is growing day by day, personally, and fortunately, I could say that we are receiving requests from many different kind of company coming from an enormous variety of markets. “From labelling and flexible packaging, through to the textile industry, we could say that many converters or manufacturers or brand owners are looking for the right technology that allows to provide new products. “The product customisation and the variable data are not the only reason which justify the digital’s growth; many industries would like to introduce the inkjet technology in order to optimise and reinvent their conventional processes. The ceramics industry gave to everybody the right example of how the Inkjet technology changed that world. “Most of our business opportunities are coming from the conventional printers manufacturing companies. Thanks to our lines of products, we are able to fit perfectly the customers’ needs. Whatever the printing mode or chemistry required, we can offer a Plug&Play solution that allow our customers to reduce drastically the time to market. The industrial print market is a wide-ranging and far-reaching sector that covers a host of areas. However, one thing that is seemingly clear for the general market is the high level of focus and effort going into the development of new products to help those in this area grow their business. FESPA 2018 this May will offer visitors from around the world the chance to get up close and personal with a whole range of technologies and solutions. Running from May 15-18 in Berlin, Germany, the event will feature some of the biggest names in industrial print, each of which will be showcasing some of their latest solutions.